CS Globe reports; Anyone who’s ever been given one of their friend’s Adderall knows the powerful effects brought on by this tiny unintimidating pink pill. Increased energy, enhanced ability to focus and concentrate, and a euphoric sense of being are the most common effects of this drug. Coincidentally, increased energy, enhanced ability to focus and concentrate, and a euphoric sense of being — are also the most common effects of crystal meth. So, why are these effects so similar? Because the drugs are nearly identical in their chemical structure. 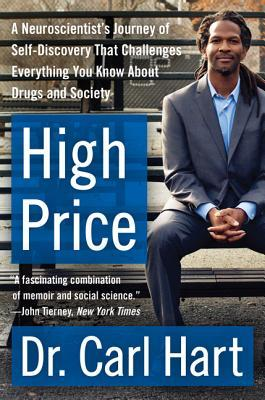 Dr. Carl Hart is a professor of psychology and psychiatry at Columbia University. Hart is known for his research into drug abuse and drug addiction. Hart was also the first tenured African American professor of sciences at Columbia University. He received a bachelor of science and a master of science from the University of Maryland and he received his Ph.D. in neuroscience from the University of Wyoming. By all accounts, he is the expert in the field of drug use. In a recent article on his website theinfluence.org, Hart explains that the only major difference between crystal meth and Adderall is public perception. Hart explains that this perception of illicit meth is largely due to misinformation put out by public service messages. “Perhaps it has something to do with public “educational” campaigns aimed at discouraging methamphetamine use. These campaigns usually show, in graphically horrifying detail, some poor young person who uses the drug for the first time and then ends up engaging in uncharacteristic acts such as prostitution, stealing from parents, or assaulting strangers for money to buy the drug. At the end of advertisement, emblazoned on the screen, is: “Meth—not even once.” We’ve also seen those infamous “meth mouth” images (extreme tooth decay), wrongly presented as a direct consequence of methamphetamine use. These types of media campaigns neither prevent nor decrease the use of the drug; nor do they provide any real facts about the effects of meth. They succeed only in perpetuating false assumptions. Swayed by this messaging, the public remains almost entirely ignorant of the fact that methamphetamine produces nearly identical effects to those produced by the popular ADHD medication d-amphetamine (dextroamphetamine). Hart admitted that he too believed that methamphetamine was far more dangerous than d-amphetamine, despite the fact that the chemical structure of the two drugs is nearly identical. However, after thoroughly researching the evidence, Hart shattered this belief. Like d-amphetamine, methamphetamine increased our subjects’ energy and enhanced their ability to focus and concentrate; it also reduced subjective feelings of tiredness and the cognitive disruptions typically brought about by fatigue and/or sleep deprivation. Both drugs increased blood pressure and the rate at which the heart beat. No doubt these are the effects that justify the continued use of d-amphetamine by several nations’ militaries, including our own. And when offered an opportunity to choose either the drugs or varying amounts of money, our subjects chose to take d-amphetamine on a similar number of occasions as they chose to take methamphetamine. It is also true that the effects of smoking methamphetamine are more intense than those of swallowing a pill containing d-amphetamine. But that increased intensity is due to the route of administration, not the drug itself. 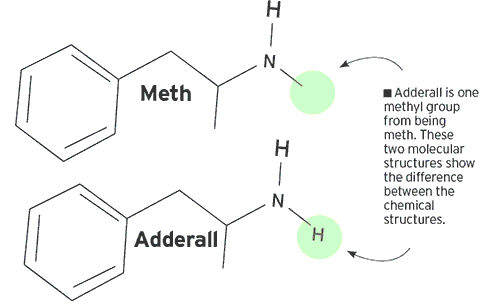 Smoking d-amphetamine produces nearly identical intense effects as smoking methamphetamine. The same would be true if the drugs were snorted intranasally. The significance of Hart’s study has a paradigm-shattering effect. On one hand, it shows that a drug, which is legally taken by millions of children in the US, is identical to an illegal substance associated with a slew of negative traits. On the other hand, it shows that meth users are not much different from the millions of Americans who take its legal form. The use of methamphetamine in the United States is actually on the decline according to U.S. National Drug Control Policy Director R. Gil Kerlikowske. However, there are over 3.5 million American children currently take an ADHD drug, a nearly 500% increase since 1990. It seems that the pharmaceutical industry has figured out a way to market ADHD to the masses in an attempt to sell them their legal version of meth. “It took me nearly 20 years and dozens of scientific publications in the area of drug use to recognize my own biases around methamphetamine. I can only hope that you don’t require as much time and scientific activity in order to understand that the Adderall that you or your loved one takes each day is essentially the same drug as meth. Matt Agorist is an honorably discharged veteran of the USMC and former intelligence operator directly tasked by the NSA. This prior experience gives him unique insight into the world of government corruption and the American police state. Agorist has been an independent journalist for over a decade and has been featured on mainstream networks around the world. Dr. Hart explains; In our study, we brought 13 men who regularly used methamphetamine into the lab. We gave each of them a hit of methamphetamine, of d-amphetamine, or of placebo on separate days under double-blind conditions. We repeated this many times with each person over several days and multiple doses of each drug. Like d-amphetamine, methamphetamine increased our subjects’ energy and enhanced their ability to focus and concentrate; it also reduced subjective feelings of tiredness and the cognitive disruptions typically brought about by fatigue and/or sleep deprivation. Both drugs increased blood pressure and the rate at which the heart beat. These regular methamphetamine users could not distinguish between the two. It took me nearly 20 years and dozens of scientific publications in the area of drug use to recognize my own biases around methamphetamine. I can only hope that you don’t require as much time and scientific activity in order to understand that the Adderall that you or your loved one takes each day is essentially the same drug as meth. And I hope that this knowledge engenders less judgment of people who use meth, and greater empathy. In another words more lies and more deceit from Big Pharma and the nature of medications we are consuming and what was actually harmful and what is actually beneficial for us. Next Next post: Is Peru’s Psychedelic Potion a Cure or a Curse?